Despite the middle of rainy season, we have held STCW Basic Safety Training course. However, here in Kitakyushu, the training has not been influenced by the weather, and all participants have completed the course. We would like to put the spotlight on the female instructor who plays big role in first aid practical training. She has such dignified attitude in practical session, and she is very considerate and supportive of the training. She also put a lot of her effort into preparation of the training. 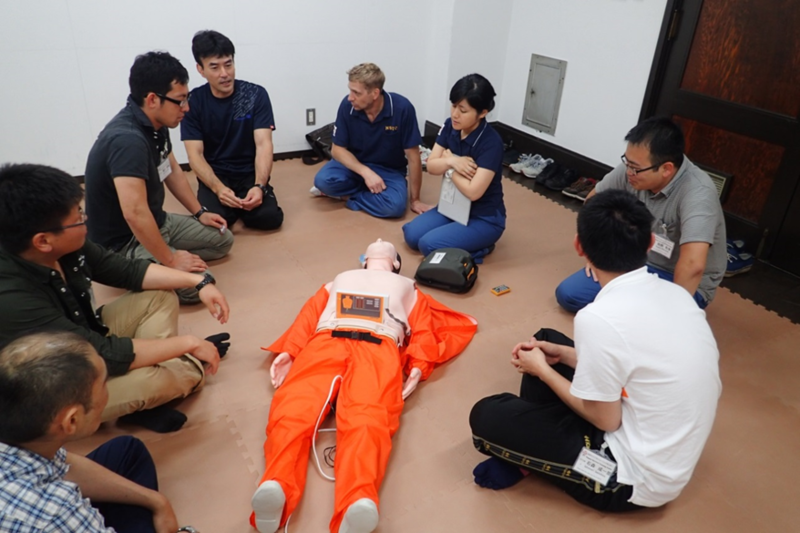 Here is the scene where they practice on CPR dummy (full body type). You can see the serious look on their face. The time is essential for the first aid, and it is race against the clock. Can you feel their enthusiasm thorough the photo? This full body type CPR dummy has a display which shows level of breath and compression strength. Here are some comments from the participants. “About knowledge of the trainer, I appreciate that he got back to me later on the detail he did not have at the time. Lecture alone could not have given me same experience, thank you. Comments like these can only come from participants who completed the five day training. We appreciate you for taking your time to leave us comments while feeling fatigue after the training. Majority of these participants have recently completed BOSIET course, and their confidence could be seen during the training. Thank you very much for training with us.